Fits all full size vans.Tapered van shelf unit fits the contour of the van to provide more cargo floor space. 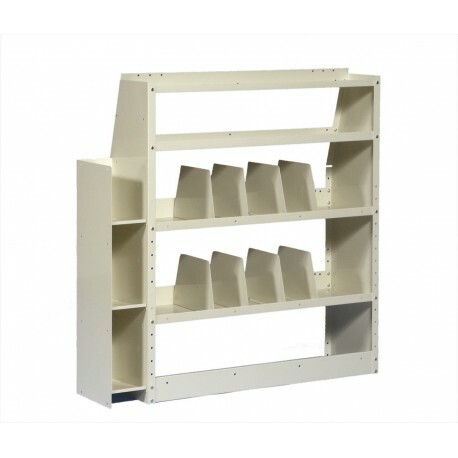 Heavy duty 16 guage steel shelves with double hemmed front lip 1.5" high and rear lip 3" high. The two 14" deep bottom shelves are adjustable on 2" centers. Bolt on shelf dividers as desired. Retainer lip at the floor prevents items from spilling into the cargo area. Catalog file neatly stores all your books, manuals and files. Finished in off-white powder coating to reflect more light in your van and to provide years of durable service. Comes complete with all assembly and installation hardware and brackets. We recommend measuring your truck to ensure a proper fit.